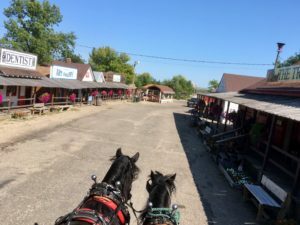 Visiting the Frontier Village in Jamestown, North Dakota has been one of my favorite summer activities for years. 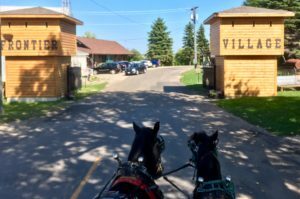 With Autumn soon approaching here on the northern prairie, I made a point of touring the village one last time just before Labor Day, and I’m glad I did! 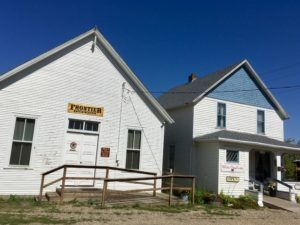 The Frontier Village is something of a live museum of life on the prairie in the frontier days of the 19th century. 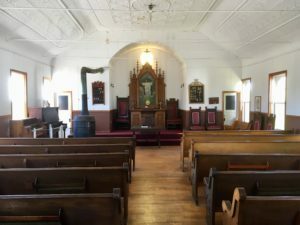 As you enter, you’ll see period houses along the left side of the road. Inside there are many hand-made crafts and pretty things for sale. I think I bought some oven mitts in one of those houses a couple years back. 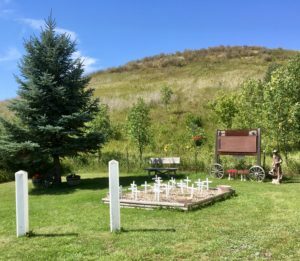 On the right side of the road will be a few small displays, including a railroad caboose, and an actual homestead cabin once inhabited by a couple from Norway. 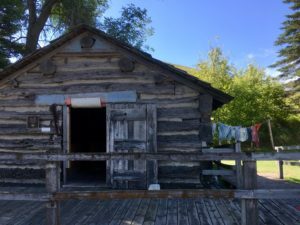 It’s worth stepping inside to see how the Iversons lived in this cabin which was built in 1898. 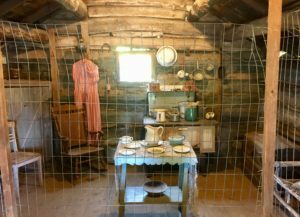 Their descendants, Orville and Lillian Iverson, donated the cabin in 1967. Sure puts things into perspective! Travel Tip: While exploring the Frontier Village or other sites in Jamestown, be sure to take advantage of the Talking Tour phone system! Just dial 701-712-9329, and then type in the code for which ever spot you’re at (the train display is 104#, for example), and a recorded description of the exhibit or site will play. It’s like having a tour guide with you wherever you go! 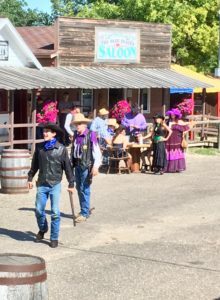 The streets of the village are lined with period structures and reconstructed store fronts, which can make you feel like you’re in an old western film set. 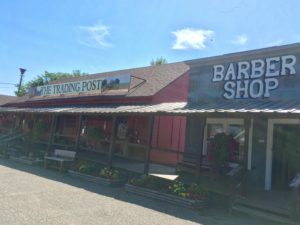 I recommend the General Store for refreshments and souvenirs, but the Trading Post also has some neat leather goods. 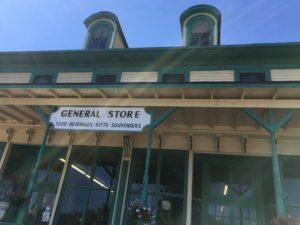 I’ve bought cowboy hats, bison horns, and even antique postcards there over the years! 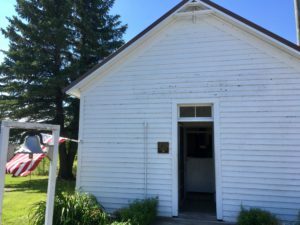 The prairie schoolhouse and pioneer church are also worth exploring. I believe weddings can be had in the old church. Wouldn’t that be fun for a frontier-themed ceremony? 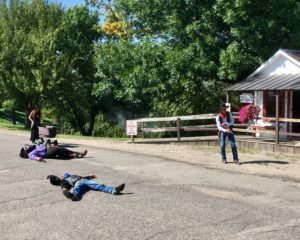 Out behind the church there’s a mock cemetery which I have been told memorializes those cowboys who’ve acted in the village’s “shootouts” over the years. Down the street from the old church lies the National Buffalo Museum. You can read about my day exploring that fun place here. 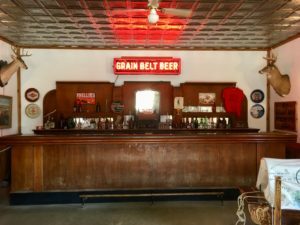 Further on the main street sits the old saloon. 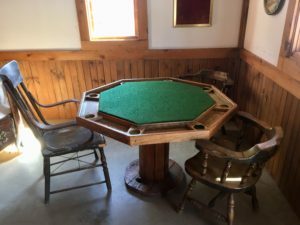 I like the “Tombstone” feel it has to it, especially with the Faro table sitting ready! Towards the end of the street you can find an old smithy, along with pony rides for the children, and at the far end, the world’s largest buffalo is on display! You can read about my visit to that famous bit of Americana here. 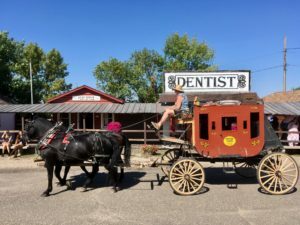 One of the more exciting things to do at the Frontier Village is riding the real life stage coach as it bounces along the main street, out past the gates, and then back again after circling the old fort just outside the village. I was fortunate enough to catch a ride up top with the driver on my last visit! 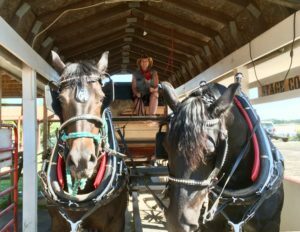 The driver had perfect control over her team and made for a wonderful experience. Special thanks to Karen and her team Willow and Moon! 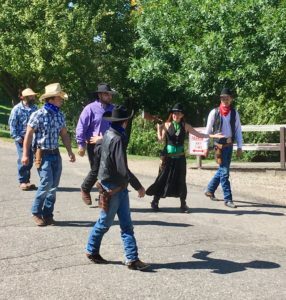 Now, the Frontier Village isn’t only old buildings, but throughout the summer also features a live performance by the Wild West Players which culminates in a good ol’ fashioned gunfight to rival even the OK Corral! It was great fun seeing how the actors interacted with the gathered audience. The show lasted about 30 minutes, and had its own bits of humor and excitement to keep everyone’s attention. In the end, the good guys won, of course. 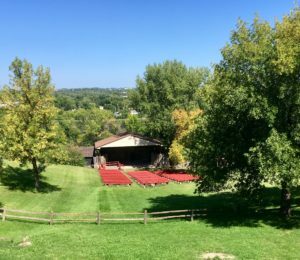 One more site worth checking out at the Frontier Village is the theater positioned at the bottom of a grassy hill near the entrance to the park. I think the loveliest performance I’ve seen there was a few years ago when a local Sioux Indian performed “Amazing Grace” on his traditional flute for a small gathering one evening in June. It was enchanting to hear the melody drift up the hillside! Travel Tip: If you would like to explore the village, simply take I-94 from either Bismarck or Fargo and exit at Jamestown. 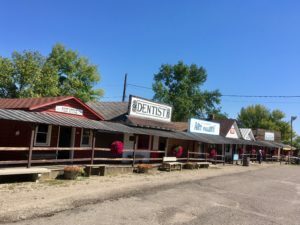 The Frontier Village can be found along the interstate with signs pointing the way to the “live herd” and the large buffalo. 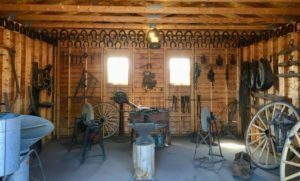 The village is open from 8am-8pm Memorial Day through Labor Day, 9am-6pm through September, and then 10am-5pm Mon.-Sat. from October 1st-Memorial Day. Admission is always free, although donations are accepted. The leaves are changing here on the northern prairie, and the nights are becoming increasingly chilly, but I’m glad I was able to make it to the village one last time before the end of Summer. If you’re in the area, be sure to explore it for yourself! 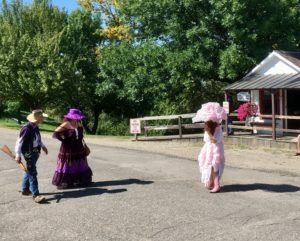 Whether it’s just you, or the whole family, the Frontier Village is certainly worth the stop! For more information, be sure to check out the Facebook page here! 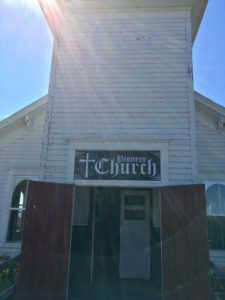 ← Prairie Postcard: St. James Basilica! Looks like a great day’s entertainment! Thanks!! 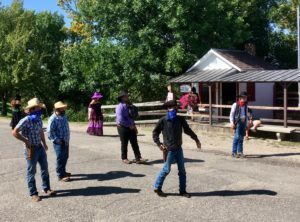 It’s always a good day at the Frontier Village! Thanks for reading, BJ! Thank You, Prairie Man, for all the wonderful Prairie travels this summer. 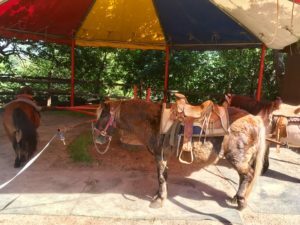 I did not get to make my usual trip out to the Prairie this summer, but I will go back through your blog and revisit all the places your travels took you to and enjoy the Prairie Summer from my couch! 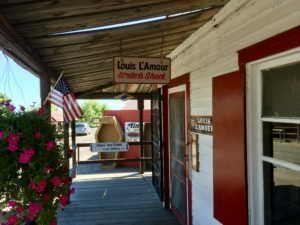 Thanks again, Prairie Man, your blog, pictures, tips, and travel spots make me feel like I’m traveling…even when I’m not!